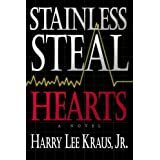 Stainless Steal Hearts by Harry Kraus (Crossway Books, 1994) 430 pages. Dr. Kraus is a missionary surgeon serving with Africa Inland Mission in Kenya. He writes novels usually dealing with medical themes. I do not often read fiction. I have read three or four of Kraus’ novels and find them informative on medical issues. This entry was posted in Gardner's Blog, Reviews and tagged Abortion, hospitality order of authorityy, Infertility, infidelity, surgery by lynn. Bookmark the permalink.